Promoted to Glory peacefully in Mississauga on Wednesday February 13, 2019 in his 81st year. 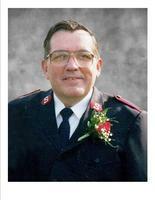 Major Bill was a Soldier of Christ, beloved husband of the late Joan. Loving father of Debbie and David. Dear Grandfather of Christine Findlay and Jolene Findlay and his brother Fred. Friends may call at The Salvation Army Bloor Central Corps, 789 Dovercourt Road (just north of Bloor St) on Saturday from 10am until service time of 11 am at the corps. Interment to follow in Mount Pleasant Cemetery. Consider providing a gift of comfort for the family of Major Bill Bowers by sending flowers. We encourage you to share your most beloved memories of Major Bill here, so that the family and other loved ones can always see it. You can upload cherished photographs, or share your favorite stories, and can even comment on those shared by others. Bill and I go back a very long time. We were mischevous as kids. Bill always seemed to be the one that got caught. Later in life we laughed together and we cried together at the loss of loved ones. We rejoiced together with the birth of children and grand children. Bill was a true man of God. He had a heart for the down and out and the unsaved. He had his own street ministry that largely went unnoticed; but not forgotten by those he touched. For several years he spent the evenings, often long into the night reaching out to the homeless and those of less than good character. In the summer he would offer them a chocolate bar and conversation. He reached out in love as he shared his faith saying the candy is so sweet and they would agree. But the kicker was he would explain to them that the Love Of God was so much sweeter. For years, he was known on the street as Major Chocolate Bar. In the winter he reached out to his friends requesting mittens, scarfs and toques. He gave away hundreds of of these items. "Brother you look cold" he would say as he handed them a scarf and toque. Smiling he'd say "I guess that's a bit warmer". The inevitable "sure is” would be the reply. With a grin he would then suggest that the Love of God was much warmer. I thank God for Bill’s friendship and example and will miss him. So long for now Major Chocolate Bar. Thank you for your kind words. Dad is getting his reward and loving every minute of it. He will be missed here though.